Southampton sees it all. What with the introduction of Norwegian Cruise Line Breakaway earlier this month (see BTN 29 April and below) and Royal Princess the week after next the port has never been busier. Comparison of the Norwegian Cruise Line ship and Carnival’s Princess offering are bound to be made. Both are around the same size and both offer the latest in technologies and innovations. But they are different. Breakaway is designed as New York’s ship, a ‘break away’, usually for seven nights entertaining (mostly) North Americans, whilst Royal Princess is much more of a general purpose ship, the summer spent in the Mediterranean, with international clientele and the winter in the Caribbean. If you are lucky enough to be invited on the 3,600-passenger Royal Princess during its introductory sojourn at Southampton you will experience a new-generation holiday ship for Princess Cruises. Among the special features found on board is a greatly expanded atrium, the social hub of the ship; a dramatic over-water SeaWalk, a top-deck glass-bottomed walkway extending more than 28 feet beyond the edge of the vessel; plush private poolside cabanas that appear to be floating on the water; the new Princess Live! television studio; a patisserie, a special Chef’s Table Lumiere, essentially a private dining experience that surrounds diners in a curtain of light; and balconies on all outside staterooms. To find out more this summer you will have to take a flight to Barcelona or Venice. Southampton may be the big send-off but once a real Royal Princess names her she is south bound to warmer waters. 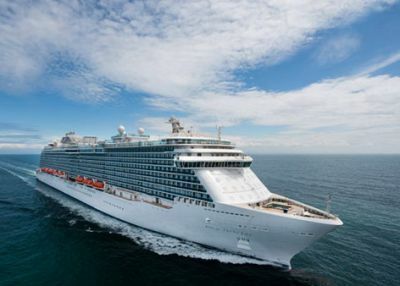 Lucky enough to be on the invite list Business Travel News will initially review Royal Princess next month. Many years ago for the family holiday we went ‘down to the sea.’ Things have changed somewhat over time. With the children, and sometimes grandchildren, is it ‘upon the sea’ that we now take the break. And rather like the holidays themselves the resort ships on which we now find ourselves afloat bear little resemblance to the traditional liners of yesteryear. The 21st century cruise ship is a carefully designed holiday package leaving all the cooking and cleaning behind. You don’t even have to spend money, at least until the final bill arrives as you prepare to leave your home of the last few days at the end of the trip. 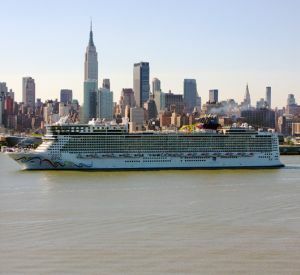 Norwegian Breakaway is the latest ‘holiday at sea’ to arrive from a company that has been in the business since 1966, a certain Ted Arison (now Chairman of Carnival) one of the founding fathers. Norwegian Breakaway comes in at 144,000 tons (Queen Mary II is 150,000 tons). It is just over 1,000ft long, 133ft wide and has 1,600 crew for around 4,000 passengers. That puts her in the ‘very big ship’ class. Her home port is New York. If the seas are calm, which is not always the case, living on board is just like living in a well-designed large hotel. Accept that there is a lot of people about and you will not be overcome by numbers. Moving around is very easy, the lifts (elevators) cope easily, and most ports have got their act together when it comes to boarding. If it is an early evening departure there is usually something of a rush when guests are first accepted on board around noon (for some reason holidaymakers must grab that first meal) but by mid afternoon it would have all settled down. That is the best time to arrive if you are on a longer cruise. Last year Norwegian introduced Epic, slightly larger than Breakaway and different with a traditional promenade deck. Breakaway features an open-air boardwalk, The Waterfront, and 678 Ocean Place; a wide range of indoor and outdoor venues on three decks that creates a whole new complex at sea enhancing the guests’ connection with the ocean. It really works and whilst a very busy night stop is not the best way to view a ship one can easily imagine sitting out on deck dining on the way to Bermuda or one of the Caribbean islands. Norwegian Breakaway’s entertainment includes three Broadway shows: five-time Tony nominated Rock of Ages, the dance sensation Burn the Floor and for a $30 supplement the Cirque Dreams & Dinner. Watch the show and dine at the same time. The quick change artist is an amazing performance, possibly 10 different costumes each one becoming something else in two or three seconds. It has to be seen to be believed. The famed comedy troupe The Second City, Howl at the Moon duel at pianos, and New York’s own Slam Allen perform on the vessel. Norwegian Breakaway will also feature an exciting fireworks show on every cruise that should dazzle guests on the second to last night at sea each week, and will be the grand finale of a decadent 1980s-themed deck party. The ship features a total of 27 dining options on board and an Ice Bar, which is kept at 17 degrees Fahrenheit and features New York City-inspired speciality cocktails, as well as ice sculptures of the Brooklyn Bridge, Statue of Liberty and the Chrysler Building to pay homage to New York City. The top decks of Norwegian Breakaway include the first Aqua Park at sea with five full-size water slides including twin Free Fall slides which Paralympics star Ellie Simmonds tested. She is young and brave. They are not for everyone. There is a three-storey sports complex that includes the largest ropes course at sea, a nine-hole miniature golf course, basketball court, rock climbing wall and more. 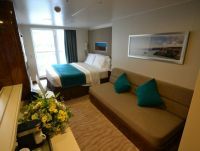 The ship features a rich mix of stateroom options including The Haven by Norwegian, comprised of 42 Suites at the top of the ship and 22 additional Suites located throughout the ship; the innovative Studios, designed and priced for solo travellers; Oceanview staterooms, Balcony and Mini-Suites; along with Spa Balcony, Mini-Suites and Suites in close proximity to the spa. Really impressive were the standard balcony cabins, 21sq m minimum and featuring easily the best bathrooms at sea to date with a full size shower. In the slightly larger mini-suite there are even double sinks. On Breakaway the beds are by the balcony sliding door, the opposite of Epic. This means as you enter on the new ship you are straight away into the lounge area. NCL should organise a customer vote for next year’s Getaway (Miami-based). I know which one I would go for. The flat screen TV is on a swivel. Breakaway is a family holiday ship with speciality areas in different age groups right up to 17. Deposit your child in the morning, pick them up for lunch and supper (the 12 plus group can go off by themselves to eat) and collect them late at night. Effective with the first cruises in 2014, Crystal Cruises will eliminate smoking in all indoor areas, except for its Connoisseur Club smoking lounge. Outside smoking will be allowed in a limited number of specially designated spaces. The revised policy begins with the 5 January and 8 January voyages of Crystal Serenity and Crystal Symphony respectively and eliminates smoking in all staterooms and suites, the Crystal Cove lobby lounge and Pulse and Luxe nightclubs.